Therese Graham celebrated her birthday Wednesday as she often does, by having her blood pressure, cholesterol and blood sugar measured by students from the University of New Mexico College of Pharmacy. Clutching a sheaf of paperwork that recorded her numbers – all very good, although her “good” cholesterol levels were a little low –Graham said she was impressed by the white-coated pharmacy students, who were manning a long table on the ground floor of the Roundhouse. 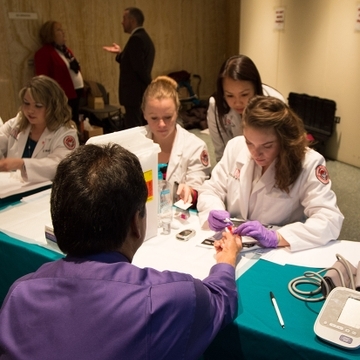 Fifty or so pharmacy students, joined by five nursing students from the University of New Mexico Health Sciences Center, were offering the free tests and health counseling to passersby as part the Legislature's UNM Day. Graham says the annual health fair usually occurs around her birthday. “I wait every year for this,” she said. Nursing students Ashley Valencia, Cierra Dorado and Sybelle Cano, all in the second semester of their bachelor's nursing training, waited for visitors with stethoscopes slung around their necks. It was their second health fair in a week, Cano said. The nursing program puts students into patient care settings early in their training, although the students also spend lots of time diagnosing problems and drawing blood from a sophisticated mannequin that bleeds, sweats, breathes and turns blue, Cano said. “We can even set up IVs and draw blood,” she said. Next door, pharmacy students saw a steady stream of people, including legislators and legislative staffers. They used automated equipment to take glucose and cholesterol measurements, performed body mass index measurements and administered flu shots. 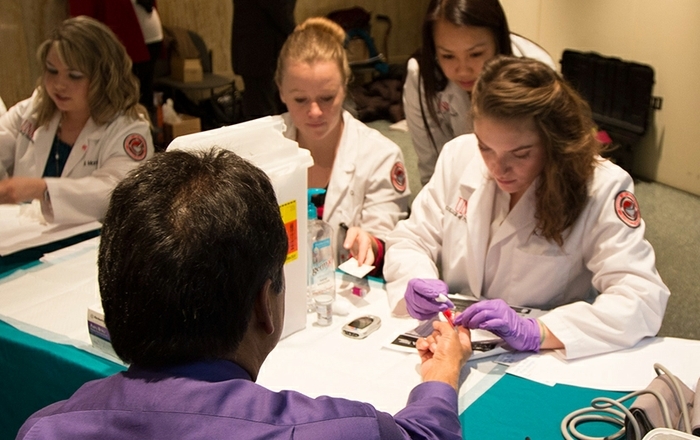 The experience was helping to prepare them for a career in which they are likely to play a significant role in providing basic health care and other services, such as providing tobacco cessation counseling, said Lynda Welage, dean of the College of Pharmacy. A group of pharmacy students standing nearby were preparing to visit lawmakers' officers to press for a series of pharmacy-related initiatives that require legislative approval. One would enable school nurses to administer epinephrine and albuterol treatments to asthmatic students, said Michel Disco, assistant dean for external programs in the College of Pharmacy. Another priority is winning state regulation of pharmacy benefit managers, the companies that determine the amount pharmacies are reimbursed by insurance companies for the drugs they dispense. Disco said she had already given the students a crash course in how legislation is drafted and enacted. The students were also serving as ambassadors for their profession, Disco said. “They're going into the legislators' offices and talking about what pharmacists can do,” she said. Luke Neff, a third-year pharmacy student and head of the UNM chapter of the American Pharmacist Association Academy of Student Pharmacists, said he wanted to make sure lawmakers understood that many insurance providers (including Medicaid) do not recognize pharmacists as health providers who can be reimbursed for their services. Megan Thompson, an associate professor in the College of Pharmacy who oversees student professional development, added that the reimbursement issue is particularly important for small independently owned pharmacies, who are often unable to absorb gaps in insurance coverage for expensive medications. Thompson says five members of the next graduating class plan to return to their hometowns throughout New Mexico to take over independent pharmacies. That's encouraging news at a time when a wave of older pharmacists is retiring, and many are selling their businesses to national chains because they have no one to take over for them. Third-year pharmacy student Radhika Modi and her brother Arjun (a first-year), both plan to return to their hometown of Hobbs after they graduate. Radhika says she discovered the importance of pharmacy while on a medical trip to Honduras she took while a UNM undergraduate. “Hobbs gave my family a lot, and it's important to give back to the community,” she says. This year was the first time nursing students were part of the health fair, said Leeanna Vargas, a teacher in the College of Nursing. Although they were gaining additional experience in taking vital signs, the greatest benefit lay in the chance to provide health counseling to the people who sat down to have their blood pressure measured, Vargas said. Katrina Roanhorse, who grew up in To'hajiilee, N.M., but attended Albuquerque's West Mesa High School, said she has lately been interested in public health nursing. “I want to be able to go back to my community to practice,” she said. Standing nearby, Therese Graham said she was greatly impressed by the students' competence and their contribution to better health. “Offering this is really doing a great service,” she said.